ESP-32S Wifi Bluetooth combo module is ultra-high performance and ultra-low-power consumption Wi-Fi and Bluetooth combo wireless platform based on ESPRESSIF ESP32 chipset. 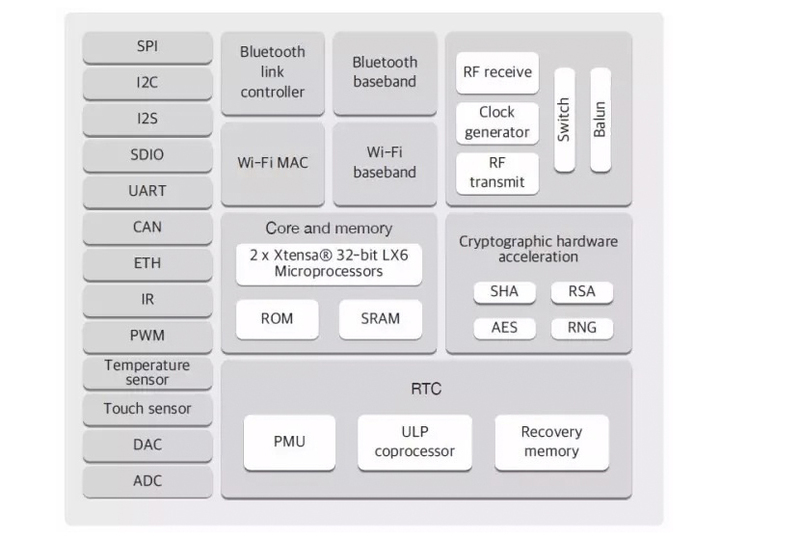 ESP-32S integrates the dual-core processor, 448 KByte ROM,520 KByte SRAM,16 KByte SRAM in RTC, 802.11 b/g/n/e/I Wi-Fi, Bluetooth v4.2 BR/EDR & BLE, clocks & Times, abundant peripheral Interfaces and security mechanism. ESP-32S Wifi Bluetooth combo module provides SDK Firmware for fast on-line programming and open source toolchains based on GCC for development support. It is designed for Generic low power IoT sensor hub, loggers, video streaming for the camera, Wi-Fi & Bluetooth enabled devices, Home automation and mesh network applications, aimed at makers, hardware engineers, software engineers and solution provides. ESP32 is a single chip 2.4 GHz Wi-Fi and Bluetooth combo chip designed with TSMC ultra-low power 40 nm technology. It is designed and optimized for the best power performance, RF performance, techtonicsstness, versatility, features, and reliability, for a wide variety of applications, and different power profiles. ESP32 is designed for mobile, wearable electronics, and the Internet of Things (IoT) applications. It has many features of the state-of-the-art low power chips, including fine resolution clock gating, power modes, and dynamic power scaling. CPU and Memory: Xtensa? 32-bit LX6 Dual-core processor, up to 600 DMIPS. 802.11 n (2.4 GHz), up to 150 Mbps. 802.11 I security features: pre-authentication and TSN. 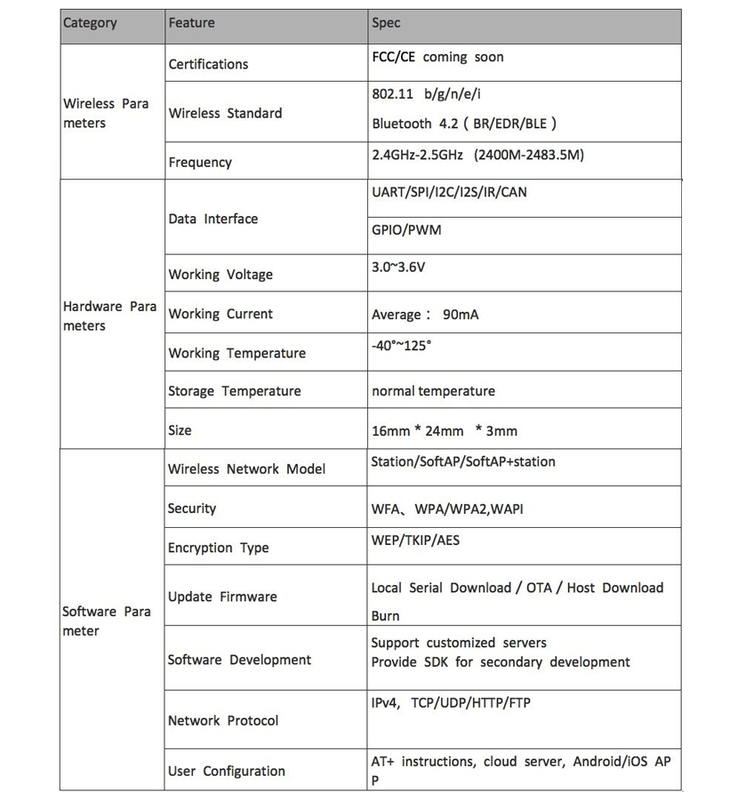 Wi-Fi Protected Access (WPA)/WPA2/WPA2-Enterprise/Wi-Fi Protected Setup (WPS). Infrastructure BSS Station mode/SoftAP mode. Wi-Fi Direct (P2P), P2P Discovery, P2P Group Owner mode and P2P Power Management.